You might be thinking that there’s no way a bright green bowl puréed veggies can be filling and comforting enough for chilly weather, but this Winter detox soup will prove you wrong. Clocking in well under 100 calories per serving, this warming, hefty soup is packed with flavour and detoxifying stars like vitamin A, vitamin C, and fibre. This is absolutely a comfort soup. The best part? There is so much veggie goodness in this soup, you might wonder how we fit it all in! 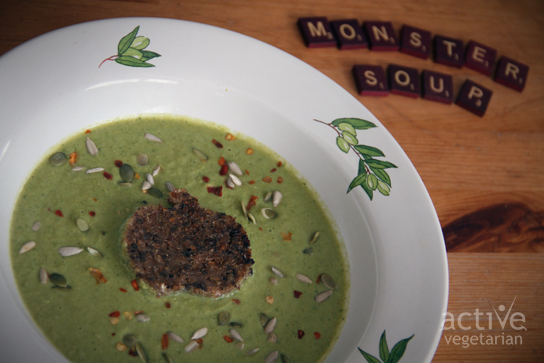 Plant-based powerhouses kale, spinach, leek and broccoli give this soup its signature colour. Coconut milk ads a delicious creaminess. Kermit may not think it’s ‘easy being green’ but we sure do. Heat oil in a large pot. Sauté onion until translucent, about 5-6 minutes. Add garlic and ginger, sauté for 2-3 minutes. Add in vegetable broth, cauliflower, broccoli and leek. Bring to a boil. Simmer soup for 10 minutes, or until vegetables are tender. Add in kale and spinach. Let greens wilt in soup for 2-4 minutes. Add in coconut milk and nutritional yeast (if using). In high powered blender, blend soup until completely smooth. If soup is too thick, add more broth or water to thin it out. Garnish with chili flakes and freshly cracked pepper, pumpkin and sunflower seeds.